Leverstock Green were beaten 4-3 by Cockfosters in Saturday’s SSML Premier Division fixture at a snowy Pancake Lane. The great efforts of Leverstock’s Bill Dawes and Keith Pym in clearing and re-marking the lines of the snow-covered pitch ensured that Saturday’s home game against 15th-placed Cockfosters could go ahead, but the result did not go the way of the Leverstock side. After Leverstock had seen the better of the early chances it was the visitors who took the lead from the penalty spot. But their lead was short-lived as Green marksman Jonathan Lacey equalised on 21 minutes. Levy skipper Shane Wood then put the host in front with an effort from close range 14 minutes’ later. 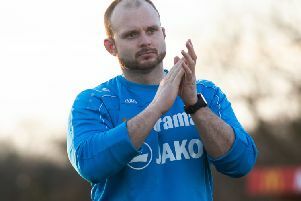 Leverstock went into the second-half leading 2-1, but an error from goakeeper Mackenzie Taylor allowed Cockfosters to level the scores at 2-2. A second penalty converted by Oscar Egboh put Cockfosters into a 3-2 lead, and Piero Bagarone added a fourth with just ten minutes remaining. Lacey netted the third penalty of the game to put the Green back into it with four minutes left, but Cockfosters were able to hold on for a 4-3 victory. The loss did not have any implications for the league table, with Leverstock remaining in sixth place in the standings. Next up for the Green is a local derby when they visit 16th-placed Tring Athletic this Saturday. The two sides have met twice already this season, with one victory apiece. They then face Cockfosters again, away, the following Tuesday, March 27.